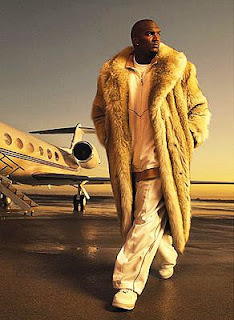 Dude, for all the bling and fur coat and baggy pants, you have a 39.8 completion rating. You have exactly 1 TD and 4 INTs and 42.4% QB rating. You just know, somewhere, Lane Kiffin is looking at the stats for Russell and Heyward-Bey (2 receptions in 4 games) and smiling. No one, and I mean no one, outside of the Twins locker room thought they would be in this position, especially after they lost Justin Morneau and Carl freakin' Pavano became the rock of their rotation. Look, I appreciate the fact that going 5-0 is tough, no matter who you beat to get there, but how is Cincinnati ranked 8th in the country, when they've beat exactly nobody? And Iowa is 12th in the nation and have beaten a ranked opponent. So Joba threw one inning of relief and looked like his old flame-throwing self. Not saying he shouldn't be a starter—he may develop into a great one—but the man would be a awesome reliever. So it's time for the annual "Eddy Curry is working out hard and is gonna apply himself this year article." After admitting he did steroids, it's nice to see Chuck Knoublauch keeping his good name intact. You had to have seen this coming. Firing Kevin Towers ,on the other hand, well not saying its a dumb move, but it kinda doesn't make sense. Towers was in charge when the Padres won the AL West twice in 2005 & 2006, and were in the World Series in 1998. Not great, but not bad for a small market team. And as for this year, God knows they were in hard-core rebuilding mode, so you had to accept that they were getting rid of older stars (Peavy, Hoffman) and setting the stage for younger players. It's not the dumbest move, firing Towers, but it's not like he was egregiously at fault either. I'll say this again as you watch the Colts highlights: Watch Manning look off defenders. Look at the ball placement to his receivers. Look at him buy time in the pocket allowing his receivers to gain a little bit of separation—his eyes never leaving downfield. Look at all that and tell me he's not the best ever at his position. Touch pass, bullet, end route, post, screen. He is the best. For a team that keeps saying its a Super Bowl contender, the Cowboys sure draft pretty badly. Here's a list of past no. 1 draft picks. OK, Felix Jones is a great home-run type, change-of-pace back. Mike Jenkins is meh. Anthony Spencer is a bust so far. Bobby Carpenter—nothing. 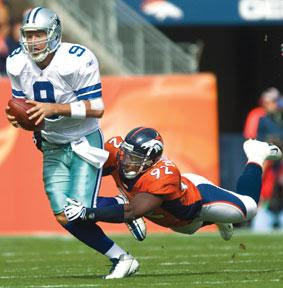 Demarcus Ware is a home run. Marcus Spears is just some guy. Terrence Newman got undressed, spanked and sent to his room yesterday by Brandon Marshall. Ebeneezer Ekuban, Shante Carver. David Lafleur. Not exactly a franchise who's good at turning out talent that will help them win consistently. Sticking with the Cowboy theme, the AAPTBNL award goes to...Elvis is in the building...Elvis Dumervil. Told he was to short and not picked until the 4th round despite a productive collegiate career, (he broke Dwight Freeney's Big East sack record and broke the NCAA record for sacks in a game—6), all Elvis has done is live in opposing team's backfield. including last night. Making Tony Romo's life extremely uncomfortable, Elvis had 2 sacks, 2 QB hits, and 2 tackles for loss. Elvis, with 8 sacks on the season, is on pace for a ridiculous 32 sacks.Congrats on proving everybody wrong Elvis. In the history of the NFL, there have been three guys named Pierre. They all play right now; Pierre Woods, LB for NE, Pierre Garcon WR for Indy and Pierre Thomas, RB for the Saints. Don't know what this means, just interesting. any other franchise would have blown Russell out by now, why haven't the Raiders? I think the Yanks would rather face the Twins. I thought the Tigers had it locked when the split with the Twins last week. What about Peria Jerry for the Falcons, isn't that close enough to Pierre? Suprised you didnt say anything about Eric Wedge being fired from the Indians. What the hell was he supposed to do when they sold off his entire team?? Oh yeah dont one of the Dolans relatives own them?